This article is about the U.S. state. For other uses, see Iowa (disambiguation). Iowa (/ˈaɪəwə/ (help·info)) is a state in the Midwestern United States. Its name comes from the Ioway people, one of the Native American tribes that lived in Iowa. Iowa was a part of New France, but was sold to the United States as part of the Louisiana Purchase. Its settlers were mostly farmers: Iowa is part of the Corn Belt and is often known as the "Food Capital of the World. "[dead link] However, Iowa's landscape, culture, and economy are diverse, with the economy changing in the second half of the 20th Century to include many kinds of business. Iowa has more than 3 million people as of the 2010 census[update]. Its capital and largest city is Des Moines. 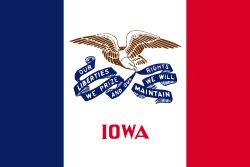 Iowa became a state in 1846. It was the 29th state to join the United States. 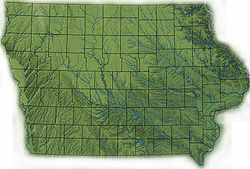 Iowa's counties and major streams. Iowa is in the Midwestern United States. To the north of Iowa is Minnesota; to the west are Nebraska and South Dakota; to the south is Missouri; and to the east are Illinois and Wisconsin. The eastern border of the state is marked by the Mississippi River which runs between Iowa and Illinois. The western border is marked by the Missouri and Big Sioux rivers. The northern border is a line 43 degrees, 30 minutes north latitude. The southern border follows the northern border of Missouri. [note 1] Iowa and Missouri disagreed about the location of the Iowa-Missouri border. This argument was ended by the Supreme Court of the United States in the 1896 case, State of Missouri v. State of Iowa, after a standoff called the Honey War. The border follows the Des Moines River for the far eastern part of the state and is at close to 40 degrees, 35 minutes north for the rest of the state. Most of Iowa is considered to be a plain. The government of Iowa has three branches, similar to the federal government of the United States. The executive branch is headed by the governor, currently Kim Reynolds (R) since May 24, 2017. The legislative branch is the Iowa General Assembly, composed of two houses - the Iowa Senate and the Iowa House of Representatives. The judicial branch is headed by the Iowa Supreme Court under the chief justice, currently Marsha Ternus. There are two major political parties in Iowa, the Iowa Democratic Party and the Republican Party of Iowa, as well as several unofficial third parties. No one party is in charge of the government as of 2013[update]; the governor is a Republican and the House has a Republican majority under Kraig Paulsen, but the Senate has a Democratic majority under Mike Gronstal. Iowa sends two senators and four representatives to Congress. The number of representatives was five, but starting with the 2012 elections is only four, because of redistricting. There are many farms in Iowa. Iowa is well known for its agriculture. Its main agricultural outputs are hogs, corn, soybeans, oats, cattle, and dairy products. Its industrial outputs include food processing and machinery. Iowa also produces more ethanol fuel than any other U.S. state. There are diesel pumps in Iowa. ↑ Iowa’s borders are defined in the Preamble to the state Constitution. The Missouri and Mississippi river boundaries are as they were mapped in the 19th century, which can be different than their modern courses. Wikimedia Commons has media related to Iowa. ↑ "State Symbols". Iowa Department of Economic Development. Archived from the original on September 2, 2011. Retrieved September 9, 2011. ↑ "Iowa: Population estimates". U.S. Census Bureau. July 1, 2017. Retrieved May 6, 2017. ↑ 4.0 4.1 "Elevations and Distances in the United States". United States Geological Survey. 2001. Archived from the original on November 2, 2011. Retrieved October 21, 2011. ↑ Alex, Lynn M. (2000). Iowa's Archaeological Past. University of Iowa Press, Iowa City. Retrieved May 9, 2012. ↑ Merry, Carl A. (1996). "The Historic Period". Office of the State Archaeologist at the University of Iowa. Retrieved May 7, 2012. ↑ 8.0 8.1 "Major Industries in Iowa" (PDF). Iowa Department of Economic Development. Archived from the original (PDF) on July 13, 2011. Retrieved May 9, 2012. ↑ "Wind Energy in Iowa". Iowa Energy Center. Retrieved May 9, 2012. ↑ State of Missouri v. State of Iowa, 48 U.S. (7 How.) 688 (1896). ↑ Morrison, Jeff (January 13, 2005). "Forty-Thirty-five or fight? Sullivan's Line, the Honey War, and latitudinal estimations". Retrieved May 7, 2012. ↑ "County Seats". National Association of Counties. Retrieved May 9, 2012. This page was last changed on 25 January 2019, at 21:50.